Battleships is the tense board game in which strategy combines with luck to help sink your enemies’ ships and now it’s arrived as an online slot machine in the shape of Battleship Direct Hit; it’s developed by Big Time Gaming with their Megaways payline structure and it comes with some clever bonus features. Battleship Direct Hit is a six reel slot with variable rows and a massive 117649 ways to win; an array of nautical instruments sets the scene below those reels while the ships to be destroyed occupy the area above. 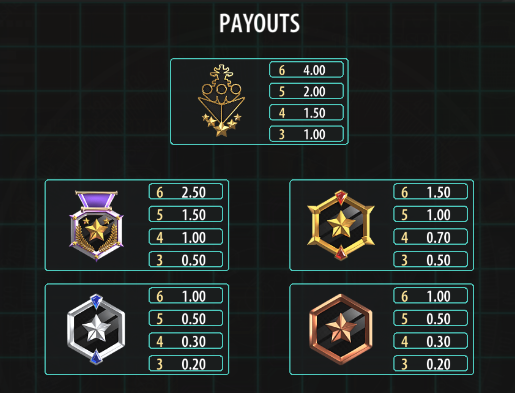 The five higher value symbols are badges denoting ranks of varying seniority while the lower values are the standard 10, J, Q, K and A.
There’s no wild symbol in the base game Battleships but the scatter is a missile which will help to trigger the main feature. Any winning combinations or scatter symbols which appear on the reels will disappear to be replaced by more falling in from above; more combos can then be formed and this process continues until there are no more wins. On any base game spin the turrets below the reels can fire up destroy a selection of low value symbols, replacing them with high value ones and hopefully a win. Any missile symbols which land on the reels will launch upwards and destroy a section of the ship directly above; once a ship is completely destroyed it will award the number of free spins it’s carrying – between five and fifty. 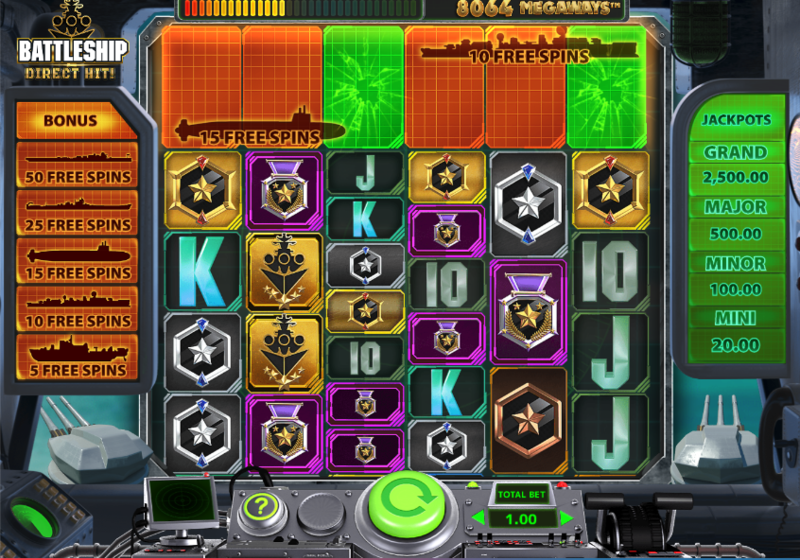 The gameplay is similar during the spins except that this time the ships may be worth more spins or one of the jackpot prizes shown to the right hand side. In addition wild symbols are present on reels two to five. Battleships Direct Hit is a an excellent addition to the Megaways series of slots and the feature is a very clever and enjoyable one; chuck in some cascading symbols and an active turret and this one is a naval triumph.